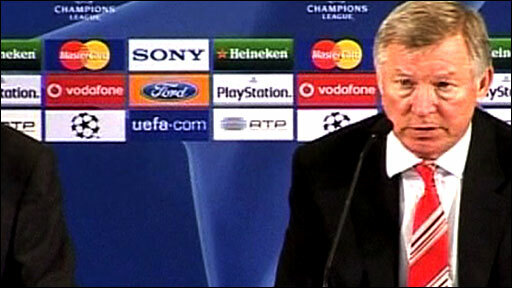 Sir Alex Ferguson hailed Cristiano Ronaldo's wonder strike that delivered Manchester United a Champions League semi-final showdown against Arsenal. Ronaldo's 40-yard strike - which the 24-year-old hailed as the best goal of his career - earned Ferguson's side a 3-2 aggregate victory over Porto. "It was unbelievable - a magnificent hit," said the United boss. "It took them by surprise and the keeper had no chance. To do it at that point gave us a real platform." Ronaldo struck after six minutes and Ferguson, who became the first manager to reach a sixth Champions League semi-final, said the early goal was a huge bonus. "We wanted to start the game quickly with good tempo... but to get a start like that, no-one can expect it, no-one can expect that type of goal," added Ferguson. Ronaldo's astonishing strike put United into the record books as the first English side to win in Porto, and he admitted he could not wait to watch his long-range effort again. "It is the best I have scored," he said. "It was a fantastic strike and I can't wait to see it again on DVD. I am very happy with it." Porto rarely looked like breaking through as United kept their first clean sheet since 11 March, having conceded 11 goals in their last five games. And Ferguson, who was taking charge of his 150th Champions League clash, said Rio Ferdinand's return after a three-game absence had made a huge difference. "Rio coming back was a major part of our success," he said. "He and Nemanja Vidic have a partnership that goes back three years. They have a great understanding of the game and there is a good balance between them. "We defended very, very well and that was the key to it really, because if we get back to that foundation of not giving away goals then we can do well. "They had to chase. That early goal had them on the back foot. I don't think they made any chances in the match." United have now stretched their unbeaten run in the Champions League to 23 games, winning a second leg away from home for the first time since the 1999 semi-final triumph in Turin against Juventus. "We tried to change and spread the team around the field and hope Manchester would make some mistakes," Jose Gomes, who replaced suspended Porto coach Jesualdo Ferreira, said. "We feel very bad. You can understand our emotions. We feel that wasn't a very just result. They scored one goal and it was scored by the best player in the world." United's semi-final with Arsenal will be the first time they have met English opposition in a two-legged European tie. Arsenal beat United 2-1 at the Emirates Stadium earlier in the season, and Ferguson is predicting another classic encounter. "It would be tough no matter who we played but the fact it is another English side gives a different type of spice to it," said Ferguson. "We are two good footballing sides, so it should be a terrific semi-final. Our game earlier in the season was fantastic. It was the way football should be played and we will look forward to it. "The first leg is at home, so 1-0 would be perfect for us. But it is not going to be easy."